The Gor Flex Flash Jack by Gor Pets flashes on impact so is easy for you and your dog to spot. Great for a game of fetch on a darker evening! 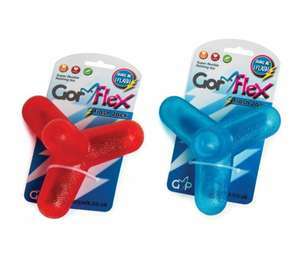 The Gor Flex Flash Jack is part of the Gor Pets Gor Flex range. This is made using TPR (thermoplastic rubber) which offers a superb combination of rubber and plastic to give a very tough and flexibletoy for dogs. The Gor Flex Flash Jack is the ideal toy for those darker evenings, it flashes automatically when it hits the ground which makes it easy to see. The Gor Flex Flash Jack will add fun to fetch as your dog will love the unpredictable bounce. In addition to the multi-coloured lights the shape of the Gor Flex Flash Jack creates a random motion and unpredictable bounce that will keep your dog on the go for hours! The shape of the jack toy also makes it easy for your dog to pick up and carry.